not bad for my first ever 5k. on friday i decided i wanted to someday run a race. 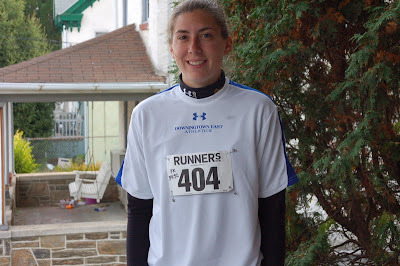 so, on sunday i ran in the "Free to Breathe" 5K in philadelphia. not much time to give myself to train. actually i've never even ran 3.2 miles before. but it was such a great time. the race started at 8:30am, and it was FREEZING! i didnt even really have a goal in mind and as i was running i just started thinking to myself... 'huh, this isnt so bad, in fact, this is actually fun!' we ran along boat house row, and it was really beautiful. there were so many people there that my motivation began to become 'dont walk, dont walk'. and i made it, i didnt walk. even with my shoe coming untied with a mile to go.... i didnt walk!